The RSA3000B Series captures a continuous time record of changing RF events and enable time-correlated analysis in the frequency, time and modulation domains with a single acquisition. The RSA3408B makes it easy for you to discover design issues that other signal analyzers miss. The revolutionary DPX spectrum display offers an intuitive live color view of signal transients changing over time in the frequency domain, giving you immediate confidence in the stability of your design or instantly displaying a fault when it occurs. This live display of transients is impossible with other signal analyzers. Once a problem is discovered with DPX, the RSA3408B Real-Time Spectrum Analyzer (RTSA) can be set to trigger on the event in the frequency domain, capture a continuous time record of changing RF events and perform time-correlated analysis in all domains. 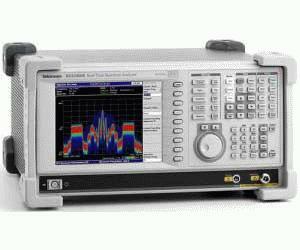 You get the functionality of a high-performance vector signal analyzer, a spectrum analyzer and the unique discover-trigger-capture-analyze capability of a Real-Time Spectrum Analyzer – all in a single package.